The astute conference attendee would have noticed hidden QR codes around the conference, as well as the scannable QR codes on everyone's badge. We wanted to find a fun way for people to bond with their new phones, as well as network with other attendees, so we set about creating a scavenger hunt game using Google App Engine & Friend Connect. The app handled game logistics (a leaderboard, URL endpoints), and we printed up a bunch of custom QR code stickers that pointed to game URLs. App Engine made writing the scavenger hunt app much easier than it otherwise would have been. The initial version of the app took one developer less than a day to turn out, and we continued to add functionality and tweak it as I/O approached and we tested it in real-world situations. The versioning deployment made it very easy to test and push out new versions without disrupting existing users. The overall structure of the app was very straightforward: every QR-code had a unique URL, which was embedded into the generated QR code. A URL was associated with a number of points to be awarded and a destination URL (such as the user's profile information, in the case of a user's badge QR code). Users were signed in using Friend Connect, which allowed us to avoid concerns of authenticating users and managing sessions. When a user visited a URL for the first time, we recorded that fact so they couldn't try and get extra points with repeat visits, then sent them to the destination URL. We also kept a running count of the user's score against the User entity, so as to not have to count up their points on every request. Generating the leaderboard was a simple matter of querying for the users with the most points and displaying them. QR codes were generated using the Chart API, which simply takes a string of text and a few other parameters, and returns a fully formed QR code. The three resourceful and persistent folks below beat out the competition to rise to the top of the scavenger hunt ranks - going to great lengths, including swag bribery, to gain points. 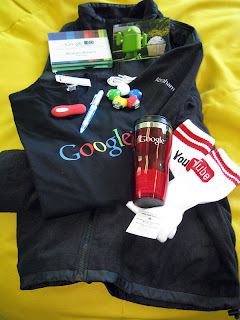 A hearty (if belated) congratulations to the winners of the Google I/O mobile scavenger hunt!